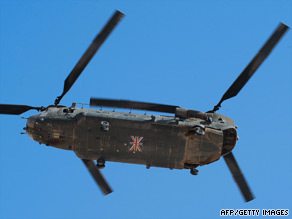 LONDON, England (CNN) -- A UK government minister on Wednesday reopened the dispute over support for troops in Afghanistan by insisting they had insufficient helicopters. Military chiefs have complained about the troops levels and equipment for the war in Afghanistan. Foreign Office minister Lord Malloch-Brown, who is resigning from the government later this week, said: "We definitely don't have enough helicopters," adding that "mobility" was vital for operations in southern Afghanistan, where British troops are battling a resurgent Taliban. Malloch-Brown also questioned Prime Minister Gordon Brown's claim that the war was being fought to prevent Afghan terrorists carrying out attacks on Britain. He said Pakistan and Somalia presented a greater threat. Last week General Richard Dannatt, the head of the army, criticized Brown and ministers for failing to supply enough men, vehicles and equipment. And Air Chief Marshal Jock Stirrup, the chief of the defense staff, said more helicopters would save lives. Until now ministers have insisted the military has all the resources it needs. But in an interview with the Daily Telegraph, Malloch-Brown said: "We definitely don't have enough helicopters. When you have these modern operations and insurgent strikes what you need, above all else, is mobility." Malloch-Brown also suggested the Taliban may have to join a future Afghan government if there is to be peace in the region. Elements of the insurgents' "support group" may have to be invited into "the political settlement" as a price of victory, said Malloch-Brown, whose responsibilities include Afghanistan. In the interview he also took issue with the PM's argument that the aim of the war is to stop terrorism spreading to Britain. "The main terrorist threat comes from Pakistan and Somalia -- not Afghanistan," Malloch-Brown said. Last week UK opposition leader Conservative Party leader David Cameron said the number of helicopters in Afghanistan was "simply insufficient" and was "the basic problem" facing British troops there. Cameron said that of the military's 500 helicopters, only 30 were being used in Afghanistan. At the same time, the number of British troops in Afghanistan has increased to 9,000, Brown said. Cameron said the government needs a "tighter definition" of the mission there and needs to show "greater urgency and more visible progress" in order to sustain public support. "The purpose of our mission is very clear," Brown said in response. "It is to prevent terrorism coming to the streets of Britain." A current operation, Operation Panther's Claw, is designed to flush out the Taliban from certain areas ahead of the Afghan elections next month. Brown said Afghan President Hamid Karzai had promised to provide his own troops and police to that operation. After the elections, the focus will shift toward mentoring and training Afghan security services, Brown said.